Dark Ceilings: will it work? I grew up with the idea that ceilings can only be painted white, right? Here are three reasons why you should consider painting your ceilings with darker colours. Dark ceilings adds drama to a space. The dark hues give a totally different mood and atmosphere to a room. It is a myth that darker hues will make a room look and feel smaller. It all depends on the shade of the colour and the proportions of the room. On the Left the dark grey extends from the ceiling to the upper section of the wall and this adds interest to the room. It also draws attention to the beautiful contrasting oval white pendant lamp. On the right the dark grey colour provides a sophisticated mood in this large open space. The grey is repeated on the window trims and the pillar. The dark wood beams give an interesting subtle colour contrast and adds texture to the ceiling instead of being a flat surface. A dark colour means anything darker than white. Left is an example of a safe grey hue. The effect is less dramatic and the mood is cooler. 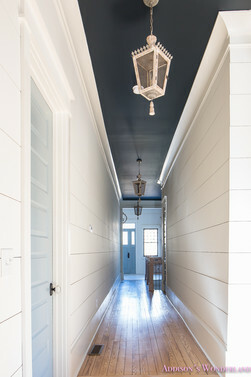 Below are two examples of passage ceilings painted in dark colours. See how it draws the eye upwards which make the passages feel more spacious. What a gorgeous entrance and isn’t that floor to die for!!! And guys please, the colour is not restricted to grey. You can go bananas!! See what I mean. This is drama and so simple to achieve. Neither be restricted to one colour or paint. Lastly don’t forget the kids room! Now any child can only have sweet dreams in a room with such a starry ceiling.